I love Adobe Air apps that bring web applications right to your desktop in slick and easy to use interfaces. Flickroom is also an Adobe Air application (beta) that beings the most popular photo-sharing site in the Internet, Flickr, to your desktop. 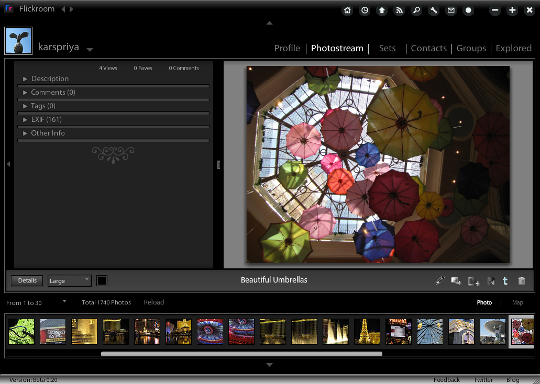 Flickroom is shiny, dark and very intuitive to use. If you are a photographer and spend a lot of time on Flickr, you will love Flickroom. I used Flickroom for a few days and I am already addicted. There are some apps that will make you use a service more than you normally did in it’s original site. I became active on Twitter only after I started using the Adobe AIR client – TweetDeck. I have become active on Facebook now that TweetDeck supports Facebook updates. Now, I am getting more active on Flickr now that I have Flickroom to browse my pictures easily. If you have a Flickr account and spend any amount of time there with your pictures, Flickroom is definitely worth checking out. Picasa & Flickr: The best photo management tools?